Live personalized fashion illustration for events of all kinds.including fashion, Red carpet, runway, parties, weddings and more! As an artist I am Showing the world what love looks like to encourage lasting love through capturing a special moment by reinventing caricature art. Experiencing art and fashion in a unique way that is growing communities worldwide in fashion and art. I am also available to be hired on a contracted basis if you want a custom art piece or dress design and illustration for your clothing brand contact me for more information on how we can work together to provide a full experience for your brand! Looking for a unique gift for the bride? These make great gifts for weddings holidays and anniversaries! Let me help you celebrate your love every day by capturng it in visuals. 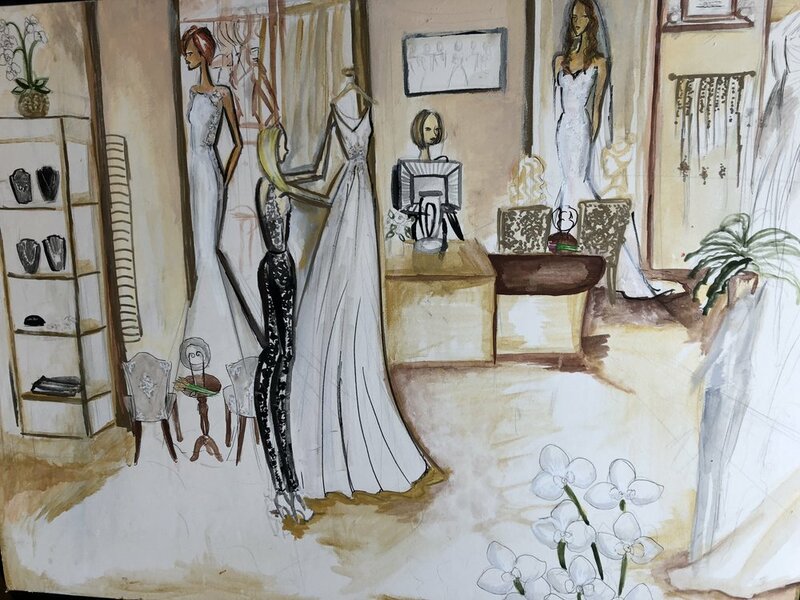 Have a memory you wish to have painted as a scene in fashion illustration whimsy style? Lets talk about what your looking for. I can do anything from painting on paper and wood even canvas. I mix media to acquire certain textures. Custom Packages range at 300 and up per event depending on size and if I'm traveling or not. As I love to travel and do this! Reinventing caricature as fashion illustration for parties and events! I sketch live at Runway events, Boutique sales, Red Carpet events, parties and weddings starting at $100 per hour. Contact me for a custom package! New Photos in services section! Images and Live art for red carpet events and fashion events. Everything can be customized. I work in mixed media combining mediums like water colors with marker or Guache to achieve certain textures and fabric renders. We can also discuss customizing an image with canvas or wood panels as is shown in the gallery above. There are many options for your project. Let me help you celebrate your love every day! contact me for more information and book your event today!